Bulk Feed Tanks (BFT) are a very popular way of storing feed due to their ease of installation, lower expansion cost and convenient hopper unloading. 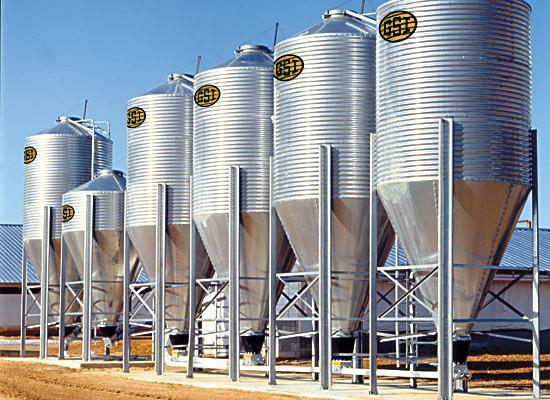 Several of these tanks can be installed to store a variety of grains and the sealed roof and body design helps protect grain/feed from moisture damage. GSI Bulk Feed Tanks are available in 6′, 7′, 9′, 12′, and 15′ diameters and range in capacities up to 77 metric tons (3182 bushels). Only GSI feed tanks feature the exclusive, patented Auto-Lok ground control access system for opening, closing and latching the fill cap safely and easily from the ground. Our cap system comes completely factory assembled, saving significant time and trouble in installation. The cap swings open a full 180˚, to lie flat and parallel to the ground, completely eliminating the annoying and all-too-frequent interference with, or damage to, the cap from the fill auger. To meet consumer demand, the GSI fill cap is also available as a replacement for destroyed or damaged caps on most tanks from other manufacturers. GSI’s drip lip water deflection system is a one-of-a-kind, roll-formed bottom sheet edge which forces water away from the hopper and lower boot area. Complete weather protection without a loss in capacity. GSI’s easy access hopper valve for hopper-bottom bins provides a simple, effective solution to accessing a small amount of material* to a location not serviced by the auger system. Most hopper valves incorporate a slide-gate at the bottom of the shroud which means the unit is constantly full of feed…feed that sits and gets stale. 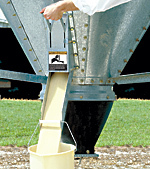 GSI’s flush-gate hopper valve features a unique design that positions the gate flush against the hopper, making it easier to operate, easier to keep clean and eliminating build-up of stale feed. The GSI hopper valve can be installed on new or existing feed tank hopper panels. This valve is warranted and recommended only for 9’ diameter, 3 ring tanks (maximum 15 tons) or smaller. It should be mounted no higher than 2” above the hopper valve collar. The GSI hopper valve features a long, adjustable chute for ease of filling a cart or wheelbarrow. Chute tab extrusions for hanging a small bucket add convenience. 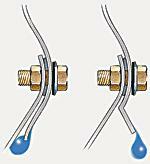 * The hopper valve is to be used for drawing small amounts of material only and not as the primary outlet. Failure to comply with correct use will void warranty. Pre-punched, extruded lip roof panels are available for the optional pneumatic fill-kit. This eliminates the inconvenience and difficulty of field-cutting the openings for the fill and exhaust tubes, and helps insure a secure, moisture-proof seal.